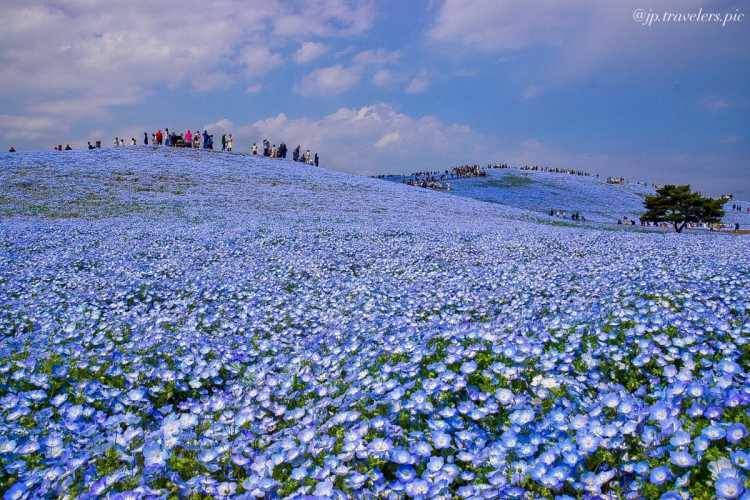 It is the Nemophila Harmony in Hitachi-kaihin park. The scenery looks like a blue carpet and goes well with the blue sky. Now, people from not only Japan but also all over the world visit here without a break. 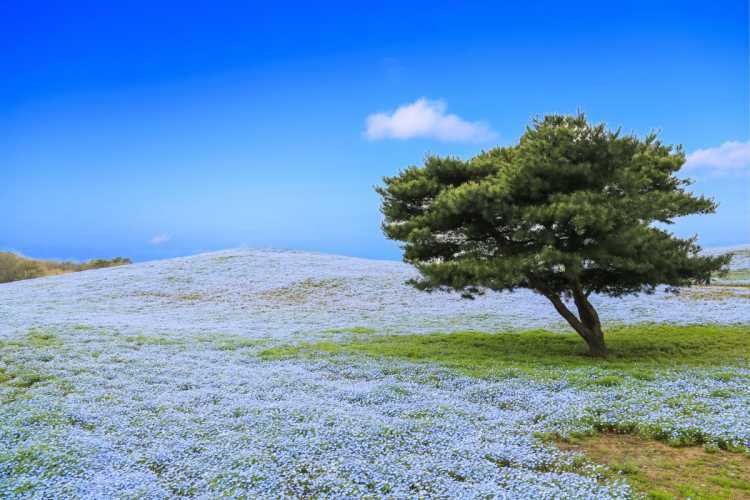 Miharashi Hills have proudly blooming nemophilas with so wonderful blue view at Hitachi Seaside Park in Ibaraki. I want you all to visit here at least once, because it's the best one among tourist attractions.◎Access: Cars must be involved in a traffic jam. You can use a shuttle bus from JR Katsuta Station, or use Hitachinaka Kaihin Railways. Twilight is the best time to see the red colored kochia, bassia scoparia. It was a little cloudy when I took the photos but this year, the bright red sky after sundown and kochia will be seen together! Can't wait! Light Green Kochia has a lovely plump shape and soft touch. 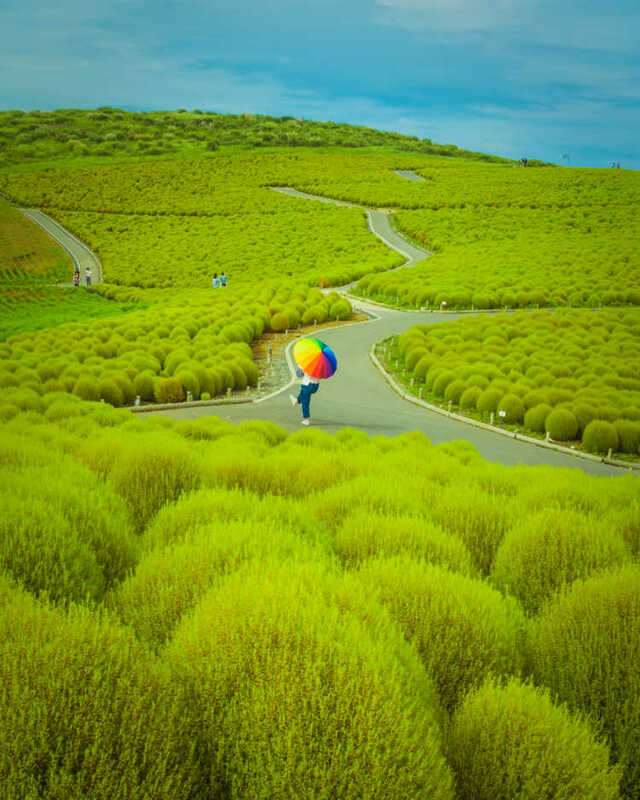 You can enjoy walking around in the forest of lovely kochia. 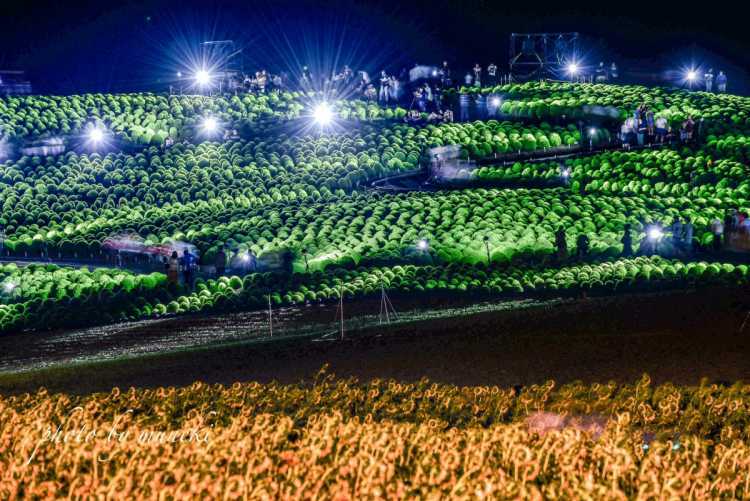 At Miharashi Hills of a flowery theme park, HITACHI SEASIDE PARK. 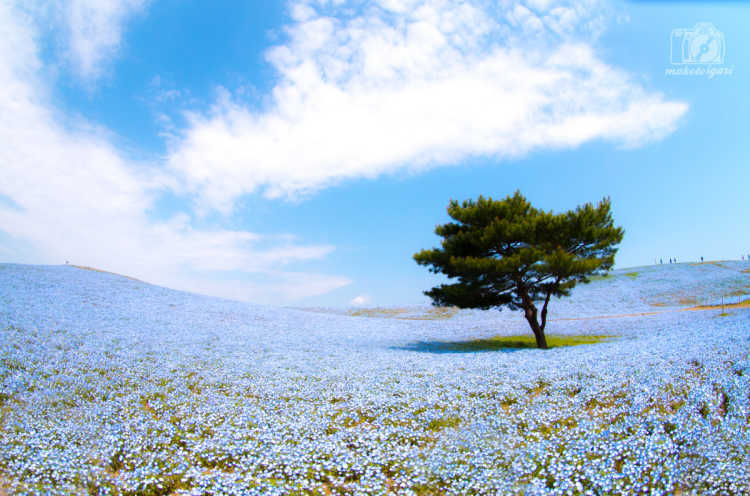 The landscape of 4.5 million nemophila flowers is surely wonderful!! 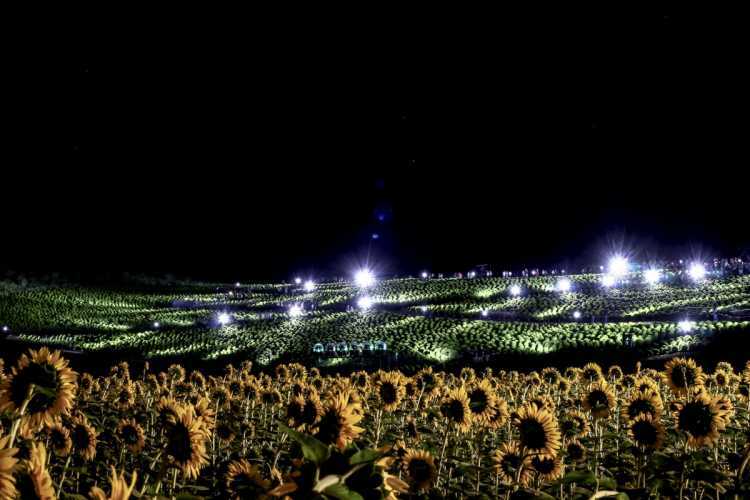 Around Golden Week Holidays this year (from the end of April to the beginning of May) could be the best season to see! Why don't you visit?◎Nemophila Harmony is going to held from 4/21-5/13 in 2018. Red Dyed World! 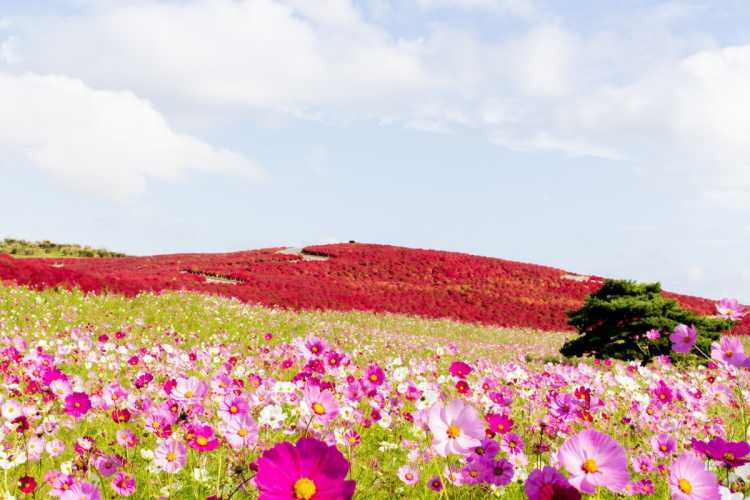 Let's Go To See The Plump Kochia In Best Season! Famous for its 'Red Hill', Kochia is now in the best season! 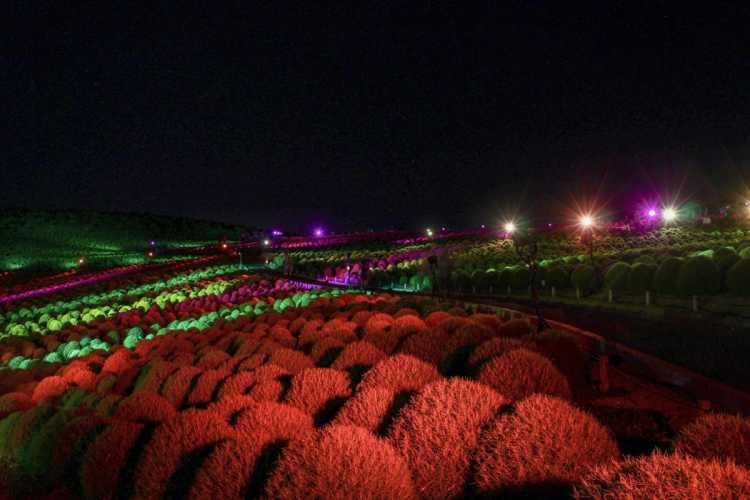 On October 23, you can enter the Hitachi Kaihin Park for free, let's go to see the wonderful red scenery! 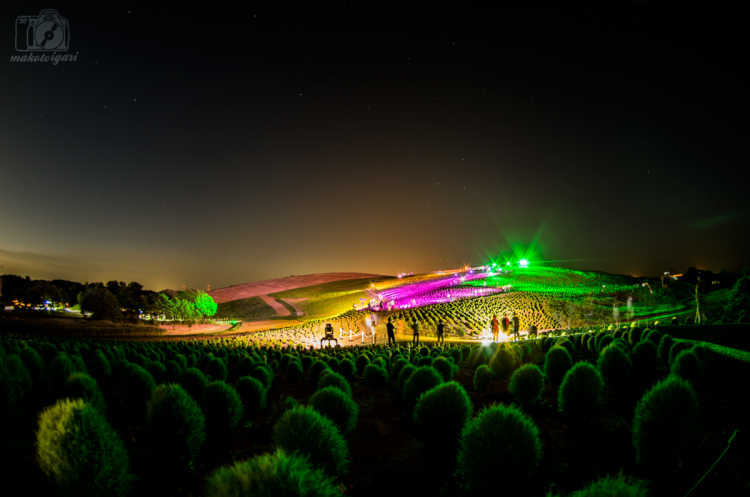 During the illumination event of green Kochia, you can enjoy various night-entertainments such as 'Gourd Lantern Exhibition', and foods good to eat while walking around. HITACHI SEASIDE PARK has become very famous because of the spread in SNS, it was a great park that could answer my expectations. 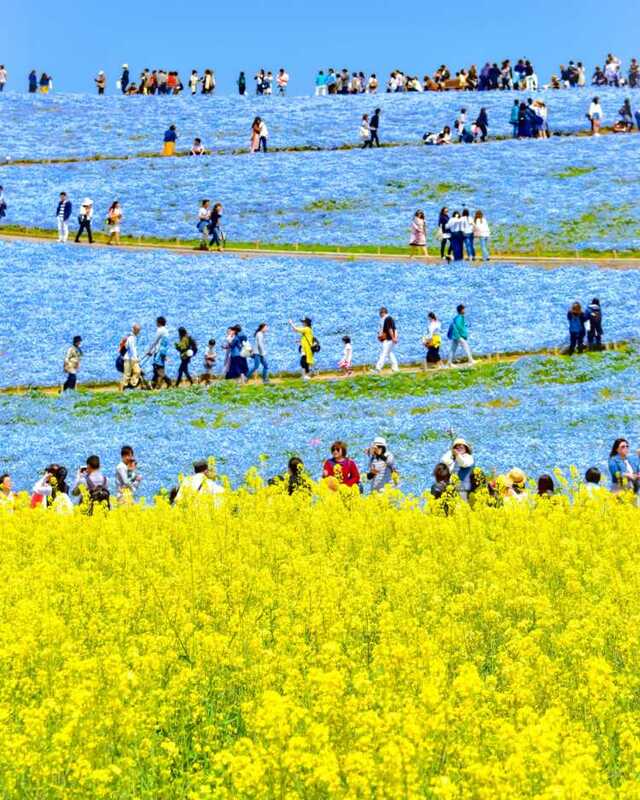 We can see the amazing blue Nemophila fields even we look from the bottom or above. 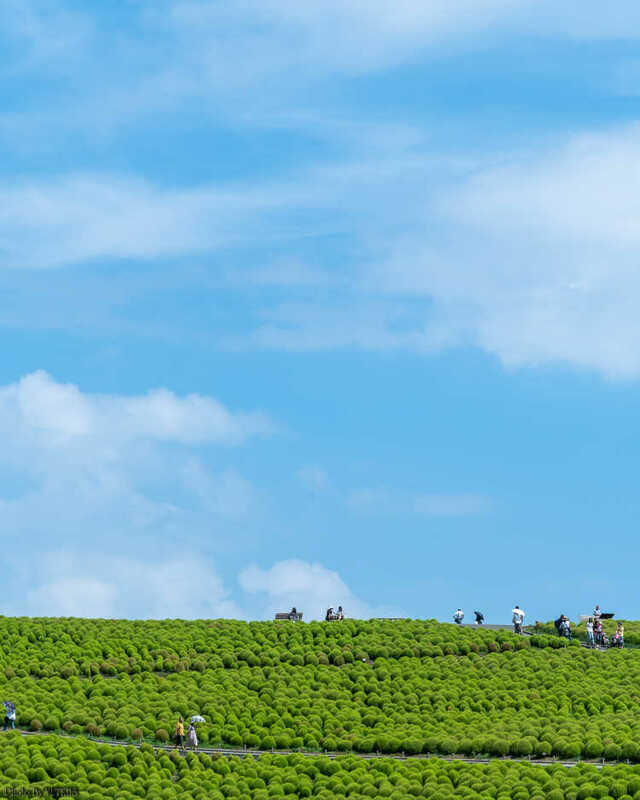 It'll be better to visit before the Golden Week Holidays (long successive holidays from late April to early May). Also, the best season of Nemophila is around those days. In Hitachi Kaihin Park, the best season of nemophila comes this year again. 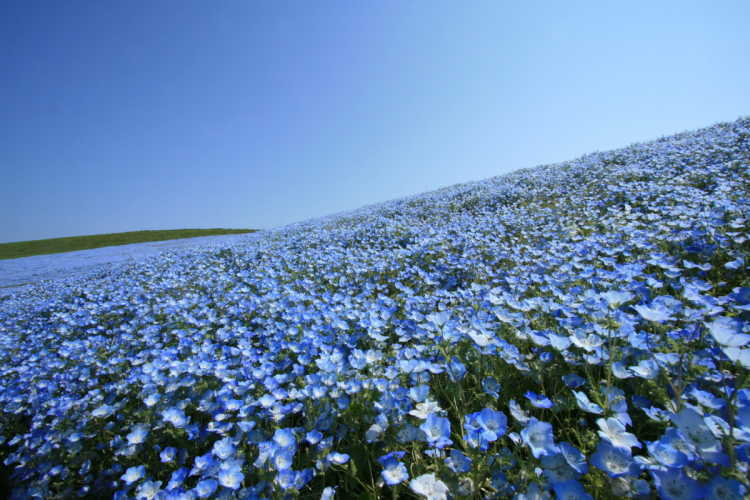 The beautiful blue carpet of nemophila is a wonderful scenery. Hitachi Seaside Park is very large! The blue flowers expanding like ocean at Nemophila's Hill, and even the tulips blooming between the trees are wonderful! Both walking and cycling could be nice, please enjoy these flowers thoroughly.◎Access: take train to Katsuta Station, then you can go to the park by bus or car. 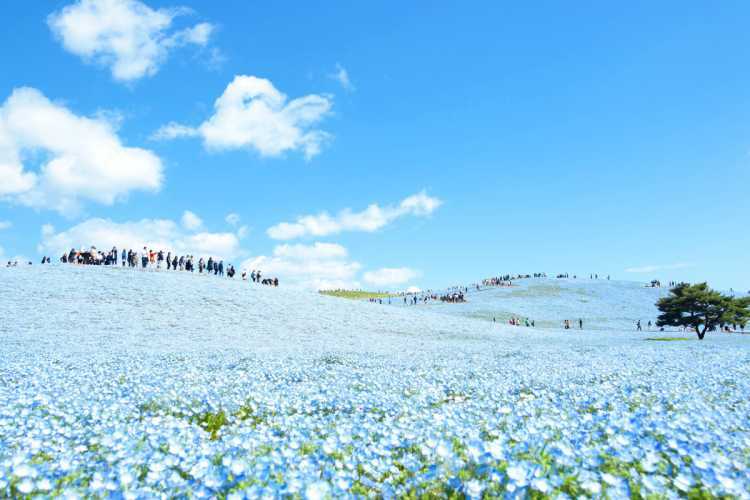 By the way, Nemophila's Hill is so crowded that it's difficult to take pictures without people. And, this park is very large, so you can rent a bicycle if you don't have much time. 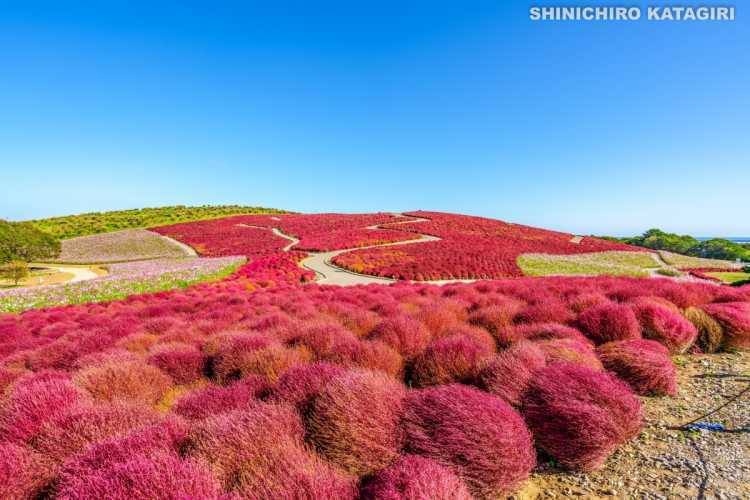 It's a famous spot to see beautiful kochia in Kanto Region. The fluffy kochia is very lovely. 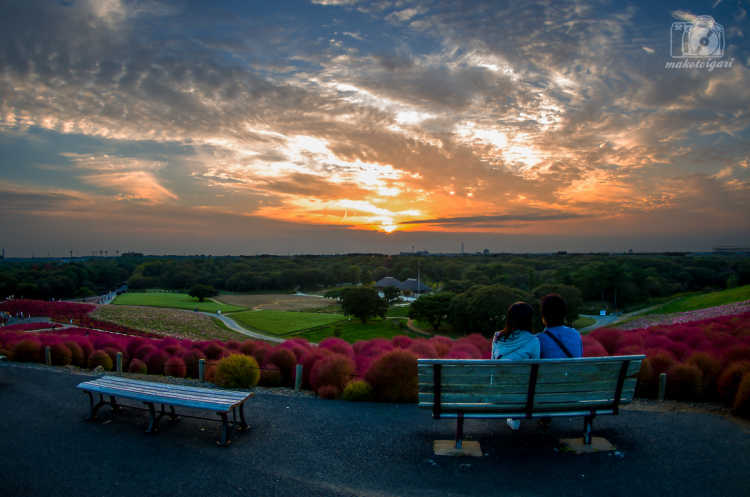 During the best season to see the autumn colored kochia, so many people visit this park, though you enter the earliest morning. One hour before open on a weekday, the park was very crowded with cars and people. Among the crowds, I run to the area as soon as it opened and took pictures which no people come in. There're red Kochia spreading to the whole ground, cosmos and pampas grass next to them. Thanks to the blue sky, it was a very wonderful place like painting. 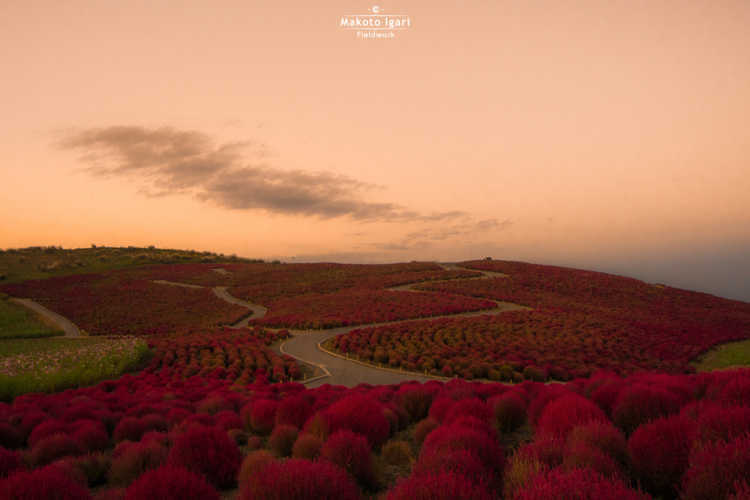 A famous Kochia Field is changing its color red from green day by day. The light-up for only 10 days. 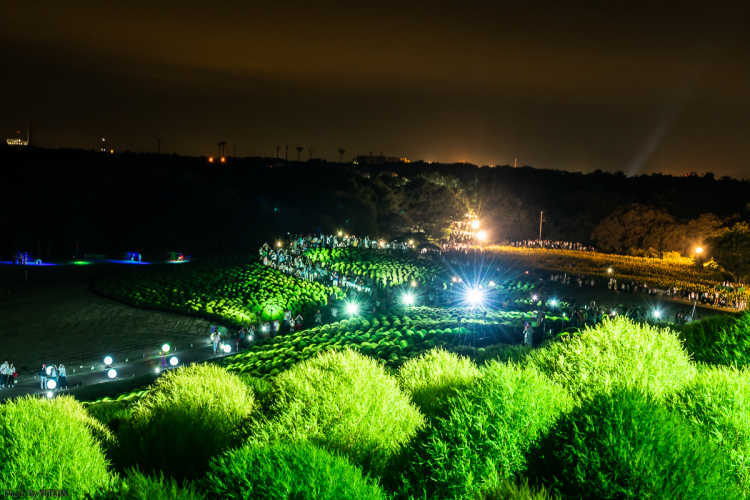 You can enjoy the collaboration of lights and music of Disney and Ghibli! From the angle you can see the sunflowers and kochia together. 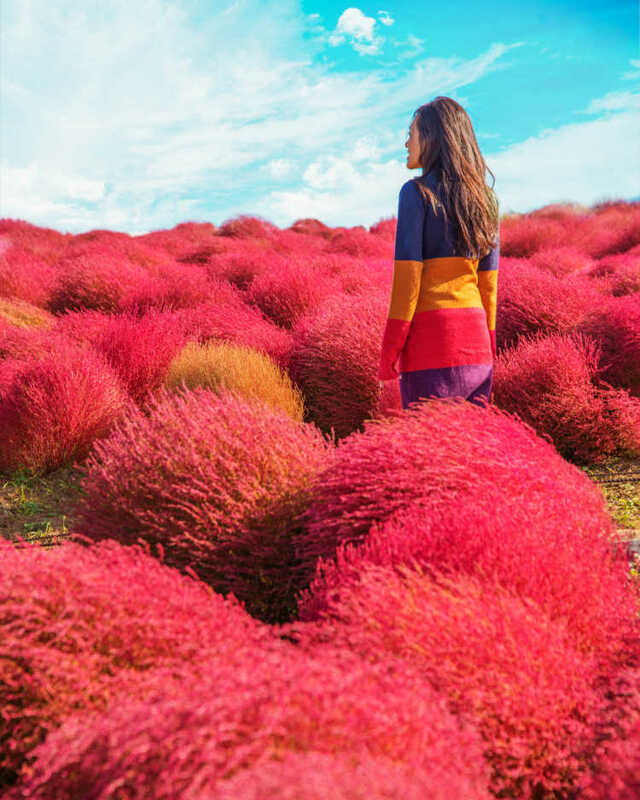 The collaboration of red kochia and colorful cosmos! If you visit here as soon as it opens, you can see this scenery with no one else in your sight! The green kochia is lit up for only about one week in summer. There're less people than that in the season of Nemophila flower, and I could enjoy them leisurely.